A team of keen cyclists from a Harrogate-based design business are getting on their bikes for the third consecutive year to help support a charity working to end youth homelessness. Absolute Commercial Interiors is sponsoring this year’s Carter Jonas LandAid Pedalthon to raise funds for property industry charity LandAid. The charity renovates empty and derelict properties, bringing them back into use as affordable and safe homes for your people. Staged by national property consultancy Carter Jonas and now in its sixth year, the ride has raised more than £60,000 for charity to date. Absolute Commercial Interiors which provides interior design, space planning, fit out and furniture to clients nationwide, is fielding a team of ten riders for the event which is being held on Friday 7 June and is the largest charity bike ride for the business community in Yorkshire. 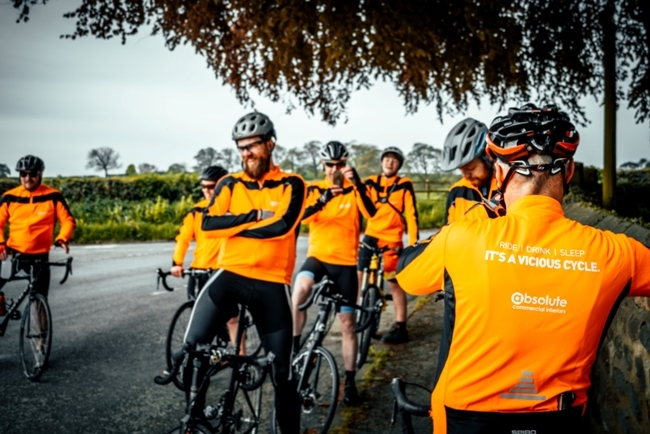 Phil Brown, managing director of Absolute Commercial Interiors, said: “We have a team of keen cyclists at Absolute and we’re all big supporters of the work LandAid does. Organised by cycling experts Iconic Cycling Events, the Carter Jonas LandAid Pedalthon will start and end at Castle Howard. Riders can choose from the 30, 50 or 75 mile routes, all through glorious Yorkshire countryside. A feature of the ride is the regular food stops along the route which showcase some of the best produce the region has to offer. LandAid works to help end youth homelessness in the UK. Last year the charity gave out more than £1.8m in funding to 39 charities across the UK, supporting 7,764 young people. The Carter Jonas LandAid Pedalthon entry is open to both individuals and corporate teams, and costs £60 per rider, £300 per team of 6 or £500 per team of 10 (all inc VAT) on the early bird offer which is available until 31 March. For more information and to register visit the website www.yorkshirepedalthon.co.uk. To keep up with all the action on twitter follow @CJPedalthon.